WARSAW, Poland, July 8, 2016 -- Just four years after signing the contract at the 2012 Chicago NATO Summit, the NATO Alliance Ground Surveillance (AGS) system will be presented to heads of state and senior NATO and national officials at the 2016 Warsaw Summit. The AGS operational capability will enable the Alliance to perform extensive surveillance over wide areas and provide actionable information on threats to our collective security to NATO and national officials for timely preparation of diplomatic and military responses. A video accompanying this release is available at https://youtu.be/reNNm7TgfpU . The AGS Summit display is the first time the deployable elements of the system have come together. Both air and ground elements have entered into the formal test phase of their development process. The aircraft's flight test program is underway at the Edwards Air Force Test range, California. Preparations are progressing at the AGS Main Operation Base in Sigonella, Sicily to prepare for the arrival of the first of the five aircraft later this year. This capability will become operational in the 2017/2018 timeframe. AGS will be available to all Alliance members and will be a key capability for Alliance strategic anticipation. The NATO AGS Force will support the NATO Joint Intelligence, Surveillance and Reconnaissance initiative, providing indicators and warnings necessary to ensure that NATO continues to project stability, whilst maintaining a position of collective defence and deterrence. 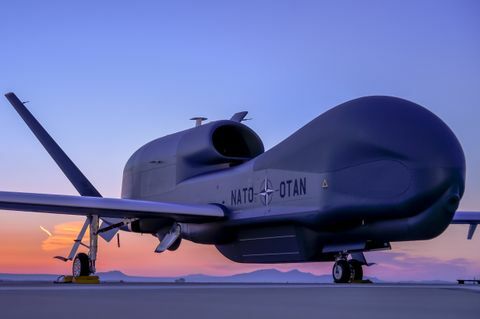 "AGS is the first NATO owned-and-operated ground surveillance system, using state-of-the-art sensors and information knowledge management systems," said Col. Pedro Renn, NATO AGS Force Commander. "AGS will be available to all Alliance members and will be a key capability for Alliance strategic anticipation. The NATO AGS Force will support the NATO Joint Intelligence, Surveillance and Reconnaissance initiative, providing indicators and warnings necessary to ensure that NATO continues to project stability, whilst maintaining a position of collective defence and deterrence." Northrop Grumman's AGS industry team includes Airbus Defence and Space, Leonardo and Kongsberg, as well as leading defense companies from the participating nations. The AGS system is comprised of five air segment remotely piloted aircraft designed and developed by Northrop Grumman as well as mobile and transportable ground stations designed and developed by Airbus and Leonardo. Airbus Defence and Space, a division of Airbus Group is Europe's number one defence and space enterprise, the second largest space business worldwide and among the top ten global defence enterprises. It employs more than 38,000 people and in 2015 generated revenues of over 13 billion euros. Leonardo is Italy's leading manufacturer in the high technology sector and ranks among the top ten global players in aerospace, defence and security. Listed on the Milan Stock Exchange (LDO), in 2015 the company recorded consolidated revenues of 13 billion euros. Leonardo is a multinational and multicultural group which boasts a significant presence in three key markets: Italy, the United Kingdom and the U.S.
KONGSBERG is an international, knowledge-based group delivering high technology systems and solutions to clients within the oil and gas industry, merchant marine, defence and aerospace. The defence portfolio comprises products and systems for command and control, weapons guidance and surveillance, communications solutions and missiles. "I'm honored that the AGS is being presented by the operational community to the nations' leaders at the Summit," said Brian Chappel, vice president, autonomous systems, Northrop Grumman. "As part of the transatlantic industry team we have had the pleasure to work with for the past four years, Northrop Grumman is truly proud to witness the transition of the system from the development to the operational phase. This success could only have been achieved through the commitment of the entire AGS team partnership – both government and industry - working across cultures, time zones and languages, leveraging national capabilities with the goal of providing the Alliance with this critical capability." As a fully NATO owned and operated system supported by the 28 Alliance nations, NATO AGS will be a key enabler of NATO's joint intelligence, surveillance and reconnaissance capability. 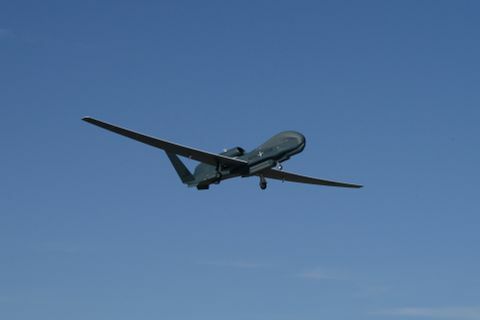 The wide area surveillance Global Hawk unmanned aircraft and the fixed, mobile and transportable ground stations will support a full range of NATO missions, including protection of ground troops and civilian populations, border control and maritime operations, crisis management and humanitarian assistance in natural disasters. The NATO AGS system is also able to ingest sensor data from national systems to continuously detect and track ground moving objects and deliver actionable information to decision makers in minutes. "We face an extremely complex threat environment," said Andrew Tyler, chief executive, Northrop Grumman Europe. "The NATO AGS programme will help address this and deliver a highly advanced system of systems capability that will provide a truly transatlantic solution for Alliance collective defence, crisis management and cooperative security."